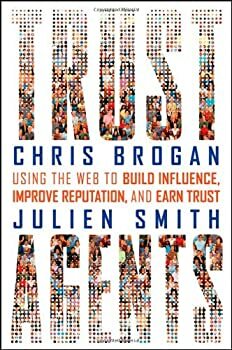 Trust Agents by Chris Brogan and Julien Smith seems to be one of those books that everyone tells you to read when you want to go into social media marketing. And it’s that sort of a wholesale recommendation that sometimes, frankly, makes me nervous. After all, how many people have read it? Are they happy with what they’ve learned? Or is the work somehow coasting on its reputation? But it doesn’t seem to be. Instead, I think there’s useful information in there – and it’s information that doesn’t seem to be found in the other social media books I’ve been reading lately, in particularly Cluetrain Manifesto and Groundswell. There’s more practical nuggets in here, more like in The Zen of Social Media Marketing. No great shock there – Chris Brogan is the coauthor there as well. One of the issues with books (you know, pulp and paper books, not electronic ones) is that they take so long to be produced, and then they can become obsolete or at least out of date rather quickly. It can almost seem like buying a new car – once you get it out of the dealership, it’s depreciated a good thousand dollars. And, once many books are published, they’re suddenly obsolete. But Trust Agents doesn’t care. Instead, it forges ahead with practical, specific tips. If they go out of fashion or become obsolete, head to the website for an update. Or, if you prefer pulp and paper, there’s always a later edition. Make Your Own Game – e. g., break the mold and experiment with new methods. This means you’re going to occasionally – gasp! – fail. So you do. Get over it. Pick yourself up and try something else. Safety and sameness aren’t really going to get you anywhere. At least, nowhere good. The Archimedes Effect – use leverage. That is, got something that’s working? Then use it to push and promote the next thing. Think of it like the spinoff to a sitcom. Laverne and Shirley was originally a spinoff of Happy Days. The first success was, absolutely, used to generate the second. Agent Zero – be the person in the center of the connections. This does not necessarily mean that you have to be the center of every conversation. It’s just – everyone seems to know someone (or know of someone) who is like this. Oh, talk to Gwen. She knows everyone. Human Artist – be polite and gracious to people. This may seem to be like a no-brainer to most, but, sadly, it’s not. Thank people. Tell them how much you enjoyed meeting them. Follow up. If this means creating a tickler file to remind you to contact people, then do that. True story – the first time I heard the term “tickler file” was in 1984 when I was working on Joe Biden’s Senate Campaign. And it made sense – you followed up with voters (in those days, it was via phone call or postcard or letter, and sometimes via an in-person visit) because you knew that, even if their support was unwavering, that they had busy lives pulling them in a million different directions. This continues to be true if not far truer these days. Build an Army – e. g., as you become the person in the middle of all of the connections, and the one who does the followups, your time will start to fill up. You’re going to need help, so link up with other people who can be social hubs and follow-uppers. This does not relieve you from thanking people, but it does help you to continue to keep in touch. There are, of course, a thousand little details that go along with these. The specifics include things like using Google Alerts to check on how often your name shows up online, and looking at AllTop and Technorati for blogs to follow. Grab an RSS feed so that you can get through more blogs with more speed. But be patient. Rome wasn’t built in a day, and neither were trust agents. You cannot take a shortcut and metaphorically substitute canned vegetables for fresh ones here. Cultivate this and pay attention to it. Much like a garden, your hard groundwork will pay off beyond your wildest expectations. And you can even leave your extra lettuce on my front porch.